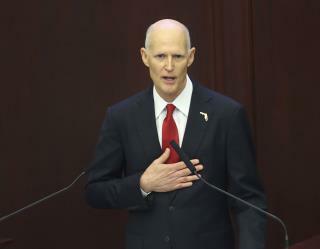 (Newser) – Just over a week after the murder of 17 people at Marjory Stoneman Douglas High School, Florida Gov. Rick Scott unveiled a plan Friday to keep his state's students safer: a $500 million proposal to ban bump stocks, restrict people under age 21 from purchasing guns, and prohibit the "violent or mentally ill" from buying weapons, NBC News reports. "I want to make it virtually impossible for anyone who is a danger to themselves or others to use a gun," Scott said, per the New York Times. The age restriction would mark Scott's first big rebuff of NRA policy, per the Washington Post. "I'm an NRA member (and) a supporter of the Second Amendment," Scott said. "I'm also a father and a grandfather and a governor. We all have a difficult task in front of us balancing our individual rights with our obvious need for public safety." The Almighty AR-15 is the final sacred adornment to most every disturbed shooter's costume before the death scene. Now, Trump mouthing the script from his NRA sycophants offer us the insane concept of arming TEACHERS, to make us safer? To anyone who thinks the only answer is always more guns - What in Hell do you think is the question? As a retired teacher, I see this garbage as the catalyzing point, perhaps a nationwide school boycott by already underpaid, overworked teachers, disrespected, abused and treated as "the help" by fat prigs like POTUS. Logical fallacy #1, conflating a general right to self defense with an absolute right to an arsenal of purely military weaponry, and ammunition. The AR-15 and its kin are the tools of efficient killing, and developmentally stunted wannabe Rambos do not get to tell us what laws mean, or what rights are. The thing I see from all the ignorant posts is this.. THERE WAS A POS DEPUTY THERE And STOOD OUTSIDE WHILE THE SHOOTING WAS GOING ON. NOT ONE FUKING MENTION; instead I see morons making stupid statements. How would restricting people under age 21 from purchasing guns prevented the Las Vegas massacre?